Yale-NUS College only started moving into its campus in May, five months behind the original schedule. This move-in occurred though parts of the campus remained under construction, such as Cendana Residential College, which was only completed three days before the move-in day for Class of 2019 in July. The delays in construction have resulted in a slow response for certain problems that have cropped up with facilities, such as spoilt lifts, toilet flushes and door knobs. Even as the College begins another academic year, some parts of the campus, such as the fabrication lab and Black Box Theatre, are still being completed. It will be about another year until the campus is completely finished, according to Executive Vice President (Administration) Doris Sohmen-Pao. The College was to be partly ready for move-in by December 2014, but President Pericles Lewis announced during a Town Hall in October 2014 that the move would be delayed to mid-May 2015. Only Cendana was originally scheduled to be completed later than the rest of the campus, by July 2015. The delays originated from a nationwide shortage of foreign construction workers, and a dengue outbreak in University Town ultimately pushed back the move-in date. 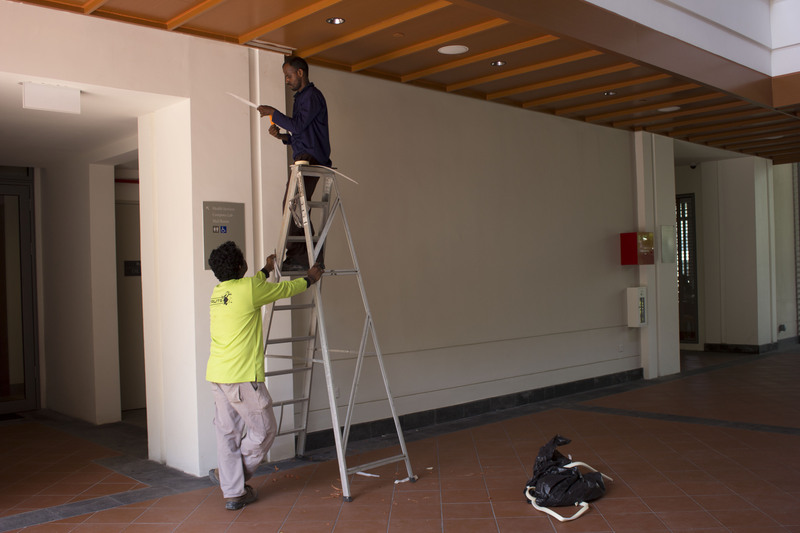 The labour crunch on the site was caused by rising levies on foreign workers to reduce the growth of the foreign worker population in Singapore. Then, in August 2014, the dengue outbreak caused a five-week stop-work order. “In the summer of last year, I was a little uncertain about [moving in January], and then when the dengue hit it was clear it wasn’t going to be possible,” Mr. Lewis said. Since the move-in happened between May and July, all the issues that needed to be addressed came up around the same time. Student Life Manager Chris O’Connell said that Facilities had to prioritize their tasks to account for construction, safety and logistical issues due to manpower constraints. For instance, he said that safety issues would take precedence over minor issues such as a broken doorknob. The Executive Vice President’s Office (Administration) directed the move-in with the Facilities department and three Student Associates. Student Associate Yee Jia Rong ’18 said that even “when it seems like the building itself is so completed already, there are still so many different things that need to be taken care of.” Mr. O’Connell said that challenges were expected since several buildings were opened at once. All five students and staff interviewed agreed that a new campus would have some problems, and highlighted the importance of taking things in stride. Yee said that the lack of widespread complaint about minor issues reflects the sensitivity of the community at Yale-NUS. “The biggest noises aren’t made about the things that affect [individual people], but rather the larger community,” he said.